Behold, dear readers, my first canning as a mom. I’m super proud. As you may have noticed, doing everything one-handed or during Rio’s naptimes has set me back a bit, and getting things done for my job and laundering diapers have been taking priority over blogging or interesting cooking. Anyway, we recently came into a large quantity of blackberries, and now that Rio is such a big boy that he can sit in his Bumbo seat by himself and watch me cook and play with toys for a bit, I decided to try this jam. The cool thing about this jam is it’s low sugar content, making it taste more like blackberries and less like, well, sugar. I love making summertime jam, and my usual is the strawberry freezer jam that my mom always made when I was a kid. The traditional recipe, though, uses as much sugar as fruit. Last summer, I bought a packet of “low sugar” pectin (the product that gels your jam), and had a major freezer jam fail, ending up with a dozen or so jars of fairly useless peach syrup. It just didn’t set up right. 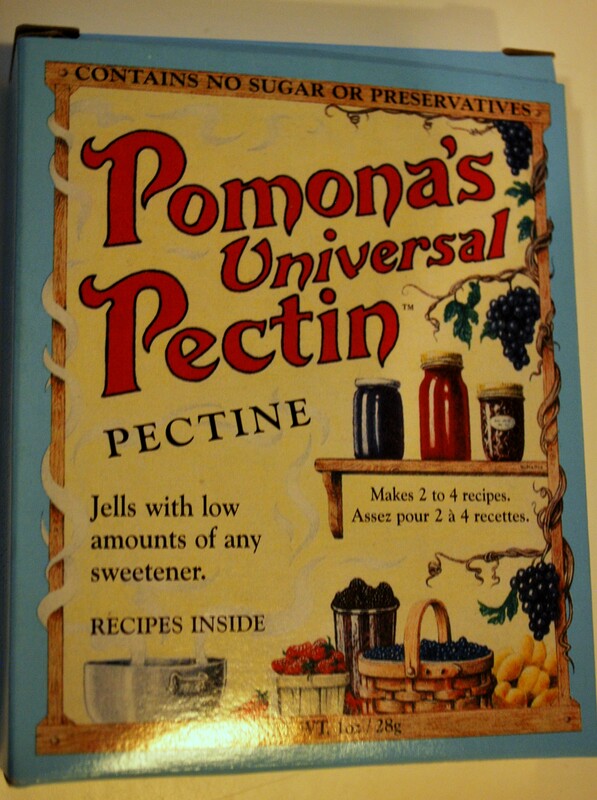 Pomona’s Universal Pectin. I found it at the Boise Coop for $4 something. The packet contains powdered pectin plus a second white powder that you mix with water to make “calcium water.” Just follow the instructions on the packet. I used 1 cup of sugar to four cups of fruit, though the included recipes give several options, including fruit-only and honey options. Pectin gets mixed with the sugar, mysterious calcium water gets mixed with the fruit and boiled, then you put it all together and jar it and voila, perfectly gelled jam that is more fruit than sugar. There are also freezer jam options, hoping to try one of those soon. Maybe I’ll thaw my peach syrup and see if I can turn it into jam. PS, here’s a picture of Rio, since you might be missing him. 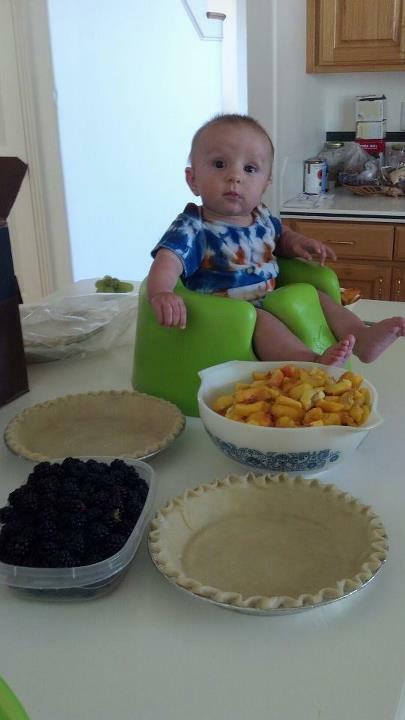 He helped me with some pies we made the same weekend. 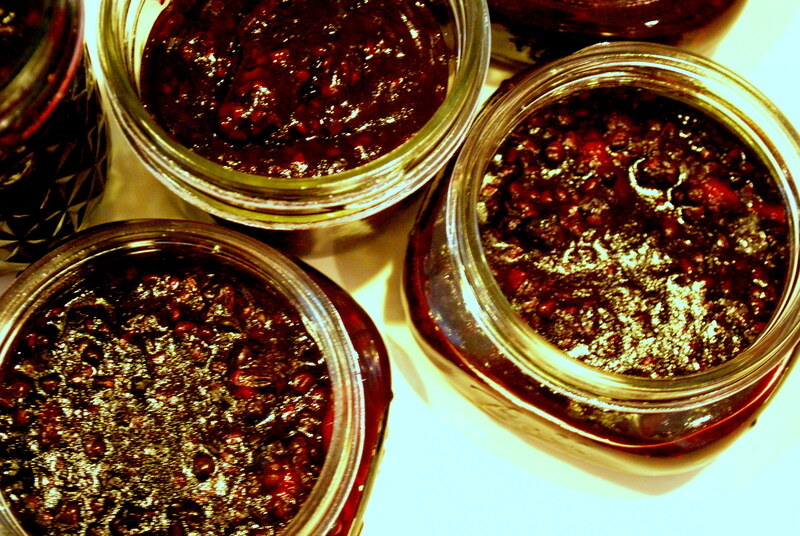 Tags: Amy Navickas, Blackberries, blackberry jam, canning, Katie Painter, low sugar jam, Pomona's Universal Pectin, recipes, Upper Rogue Organics. Bookmark the permalink. Previous post ← Birth Art, Part II….Mother’s Day Photos! Looks delicious! My trick for canning last summer was to wear Alma in a carrier on my back. Worked really well! This summer she’s pretty content to entertain herself, although she thought playing at my feet on the floor right by the stove full of boiling water was the best place to be. Made it a little nerve wracking for me! Hoping to do some tomatoes later this week! Would be tricky with two! If you really want to do some, we could make a date and switch off kid wrangling and canning. Hope you and both little ones are doing great.